The announcement that Sinn Fein will not now after all support the Welfare Bill going through Stormont has, we are told, plunged the political institutions into yet another ‘crisis’. To be fair it’s the only decision they could have taken. Although it doesn’t take a great deal of cynicism to see this move as electioneering on the part of the nationalist party. With the Westminster election only weeks away and the Free State on an election footing the party faced certain difficulties selling their message. The sort of difficulties a lack of consistency invites. Trying to sell yourself as an anti-austerity party in the South while implementing austerity in the North was never going to sustain itself throughout one election campaign, never mind two. Placing themselves on the wrong side of the anti-austerity narrative has resulted in this latest U-turn which, however tactically astute, only serves to expose their strategic weakness. Like Scotland’s constitutional nationalists, the SNP, no one could ever accuse them of being wedded to a political position. Both parties’ decision-making processes are characterised by top down, leadership initiatives which reduce party members (not to mention those pesky voters) to spectators. Just last week the SNP abandoned their key economic policy of a cut in Corporation Tax. Indeed plans to cut Corporation Tax in the North may now be scuppered as a result of Sinn Fein’s withdrawal of support for the Welfare Bill. The UK Government only agreed to devolve the power to cut the tax following the Stormont House Agreement on issues such as Welfare. Of course this is to be welcomed, as a cut in Corporation Tax would have been a disaster for everyone except big business. The SNP and Sinn Fein’s obsession with the ‘Laffer Curve’, a right-wing economic myth from the United States, was always going to end in tears. The Laffer Curve is that mad an economic idea even Gideon Osborne doesn’t fancy it. But why is this latest political manoeuvre tactically astute but strategically weak? Well, not just because these examples of political-positioning expose both constitutional nationalist parties as ideologically promiscuous rather than principled anti-austerity parties. The broader problem is it shows Sinn Fein more interested in their own electoral prospects than addressing the fundamental cause of Ireland’s economic woes: Partition. The Irish people are crying out for real change, not a change in suits. The very idea of having two health services, two education systems etc etc on the island is madness and everyone except the politicians knows it. In the Free State the political elites and their gombeen practices have been thoroughly discredited. In the North the occupation by the UK state has been a disaster. From the carnival of reaction predicted by James Connolly to a sectarian, economic basket case presided over by politicians who seem to exist only to manage a state of perpetual crisis. The solution to all of this remains democracy. Not the corrupt, counter-revolutionary version in the Free State or the sectarian headcount in the Occupied Six Counties but actually asking the people of Ireland what they want. 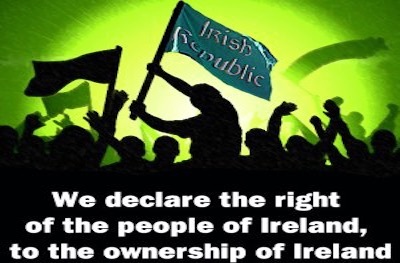 Do they want to continue with the status quo or do they want the Republic based on the Proclamation of 1916? First up must be a recognition that the continued denial of the Irish people’s right to determine their own future, without outside interference or impediment, must end. However we don’t need to go that far back as Tony Blair recently confirmed that Sinn Fein asked for an all-Ireland referendum during negotiations. Blair told the Northern Ireland Affairs Committee in January 2015 ‘we had to move Sinn Fein away from that historic position’. The UK state may have succeeded in moving Sinn Fein away from that position but they have not moved republicans. So rather than focusing on what the best position for their party to take on austerity is this week, or next week, we need to focus on the cause of the problem, which remains partition. Partition is the perpetual crisis which negatively impacts on social, political and economic life in Ireland. It won’t be ended by political parties ‘playing the game’, it will only be ended when the Irish people are mobilised to end the democratic deficit and establish a national democracy.